The diagnostic ultrasound is most typically used by radiologists, who perform soft tissue ultrasound imaging and write a diagnostic statement based on the findings. Real time ultrasound is also becoming more common in other fields. Rehabilitative ultrasound imaging (RUSI) means soft tissue imaging, which is used in physiotherapy. The use of RUSI has been trained to over 60% of the physiotherapists in Australia. The most typical areas of RUSI are evaluation and training of muscular activity. The model of the ultrasound system I use is Alpinion E-cube 7i (12/2016). 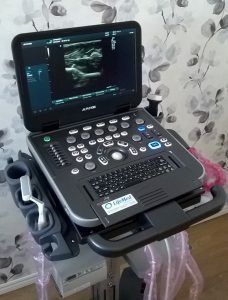 As a portable ultrasound system (7,7kg) imaging can be carried out in different places. The system includes lot of features, like spatial compounding, live dual, extended view, virtual convex and colour/power Doppler. The transducers use a new single crystal technology which increases resolution and penetration. The transducers are convex, linear and “hockey stick” with high resolution. Printing through USB or Sony printer. In ultrasound imaging, the probe is set in contact on the skin while ultrasound gel is used to avoid air getting between the skin and the probe. 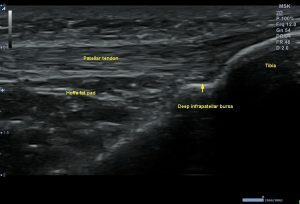 Different tissues and their surfaces reflect ultrasound differently, which makes it possible to create a picture from the returning beam. Ultrasound scanning is safe, because it doesn’t use harmful radiation, and it is completely painless. 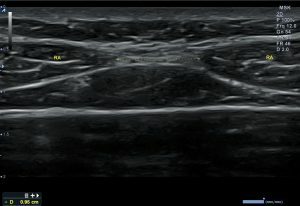 What can be seen with ultrasound? 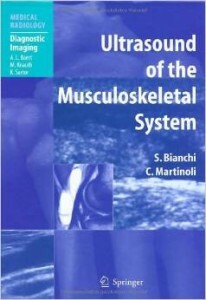 The target of MSK ultrasound imaging are soft tissues and the surfaces of bones. The structures behind bones cannot be seen, as is the case for structures behind large, air filled areas (empty bladder, lungs, intestine). Deeper structures are less visible because of the many reflecting layers above them. Still, e.g. deep hamstring muscles can usually be seen pretty clearly when a low frequency probe is used. Magnetic resonance imaging (MRI) is usually used for imaging structures inside joints. However, some structures such as part of the ACL, meniscus, femoral cartilage and shoulder labrum can also be visualised by ultrasound. The quality of the picture is affected by many factors. Cheap ultrasound systems cost a few thousand euros, but in more expensive devices the price of the probe alone may be 30 000€. Thus, the equipment is one of the key factors for the quality of the picture. Ultrasound technology is improving rapidly, and nowadays the accuracy of an ultrasound image is competitive with MRI e.g. for imaging the shoulder tendons (rotator cuff). The probe should be set perpendicular with the target. Even 5 degrees off the plumb line is enough to create anisotropy, which may mimic a structure tear, or having too little gel may seem as structure degeneration. However, anisotropy can be used to make contrast between structures when identifying them. The thickness of the fat layer, the characteristics of the structures, the depth of the target and the probe frequency are further examples that affect the picture quality. For example sometimes it may be difficult to get a clear picture of the deep abdominal muscles, if they are in poor condition and under a thick layer of fat. Muscle: The general picture of a healthy muscle is pretty dark. A muscle contains muscle fibres and bright looking connective tissue. A muscle looks darker than a ligament, because it contains less connective tissue and the amount of liquid (blood) is higher. Ligament: A healthy ligament looks pretty bright. The fibres are parallel and regular. A healthy ligament is sometimes difficult to distinguish from a joint capsule and other connective tissue structures. Tendon: The shape of a healthy tendon is smooth, although the width may change on course, depending on the type of the tendon. 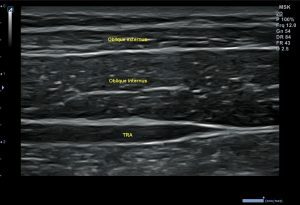 In axial view, a tendon has a pointlike appearance. In longitudinal view the bright fascicles are parallel and symmetrical. 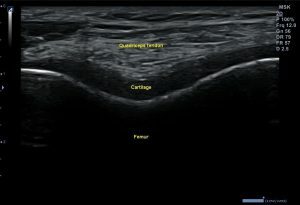 In a tendon sheath, a small amount of fluid may be seen in black. Bone: The ultrasound image of a healthy bone surface is bright and smooth. The ultrasound beam reflects from the surface, so the internal part of a bone is not visible. 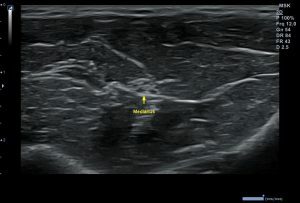 Pathological changes in the surface, like fractures, can be seen with ultrasound. Cartilage: The thin layer of cartilage in a joint, on the surface of a bone is seen in black. A healthy cartilage layer is smooth, symmetrically shaped and its thickness is normal. Nerve: A nerve looks slightly like a tendon in side view, but is rather hypoechoic. In axial view, the hypoechoic nerve bundles and the surrounding hyperechoic endoneurum make a pointlike outlook. Small nerve axons are sometimes especially difficult to distinguish from the surrounding structures. Blood vessel: Blood vessels are usually scanned using the B-Mode or Doppler ultrasound. Colour Doppler indicates the movement of blood in different colours depending on the speed and direction in relation to the probe. Doppler can also be used to evaluate the possible inflammation of the soft tissue. This is due to neovascularisation (formation of new blood vessels in the injured tissue), which is a sign of an ongoing healing process. Ultrasound is a brilliant tool for finding the exact locations of structures. In a doctoral thesis, the palpation accuracy of the hip area among physiotherapy students got considerably better with ultrasound compared to the students who practiced the palpation without ultrasound. Ultrasound can also be used to teach anatomy. The role of physiotherapy may be easier to understand when the concerned structure is seen. This may also motivate for further exercise. Transversus abduminis: The key role of transversus abdominis is to support the torso. Back pain periods are often associated with activation problems of the TRA. Ideally, the patient is able to contract the TRA without activating oblique abdominals, especially the external oblique abdominis. The muscle should also be able to relax between contractions and maintain proper activation (without activation of surface abdominal muscles) when repeatedly activated. Multifidus is a muscle group travelling by the spine. Multifidus muscle is important in both, producing movement and giving support. The role of multifidus as a supporting structure is especially important in the low back. Activation of the multifidus may be disturbed for example by back pain, and ultrasound assisted exercise may help to restore activation. Pelvic floor muscles are important e.g. for supporting the torso and preventing urinary incontinence, which is a problem for 20% of women. Improper function includes difficulties in activation or relaxation of the muscle. The pelvic floor can be scanned in the lower abdomen, below the navel and just above the pubic bone when the urinary bladder is full. A physiotherapist teaches muscle recruitment with different strategies, like asking the patient to bring the ischial bones together or to lift the pelvic floor up. The best way to activate the muscle can be determined and practiced with real time picture on the screen. Ultrsound can be used to assess the function of the structures during joint motion. Thus e.g. 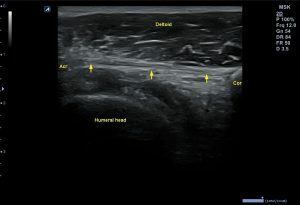 the sliding of the supraspinatus tendon in the acromial arch can be assessed. The knee meniscus sliding or the origin of different cracking sounds can be examined with ultrasound during motion, like painful gliding of the IT tendon over the femoral condyle in the outer knee (runners knee). Gliding of the fascias and thus the possible adhesions can be assessed too. Pressing with the probe (sonopalpation) may give information of the structure and tell the exact location of the pain. 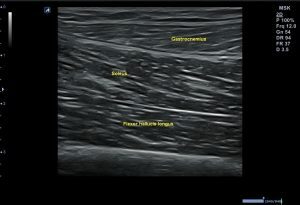 In the attached video, sonopalpation reveals an injury of the fascia of the semitendinosus muscle. This would not be revealed in MRI or passive ultrasound imaging. The size of the structures can be measured by an accuracy of less than a millimetre. Differences in muscle volume (right and left) can be a sign of unilateral load or disturbances in neuromuscular function. Muscle force is largely determined by the cross sectional area of the muscle. 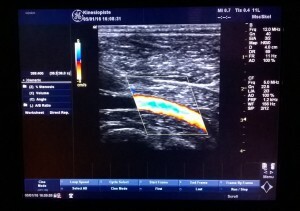 Viewing under the skin with ultrasound may give information about the real state of the soft tissue health. This information depends on various things like professional skills and the quality of the ultrasound system. A physiotherapist examines soft tissues to get information about the state of the patient to be able to treat him/her as well as possible. The possible information about the location, type and degree of injury may help in setting goals to the treatment, choosing a treatment method and planning a training program. Patients who come to see a physiotherapist are not always sent by a doctor and in those cases their diagnosis is missing. Sometimes the admission note is old and the situation may have changed, for example the irritation of the medial shin (shin splint) has developed into a stress fracture. Also, the diagnosis is inaccurate sometimes, especially if it has been done without a radiological assessment (e.g. rotator cuff syndrome). These are examples of situations where ultrasound imaging may bring useful information as an extension of the physiotherapeutic assessment. A physiotherapist doesn’t make a diagnosis, but a description of the findings and an own interpretation (kept to themselves) make a way to help the patient. 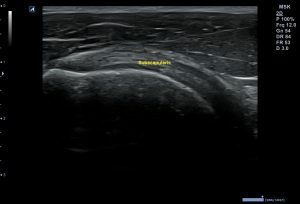 For example by using the techniques learned in the courses, the physiotherapist can scan the painful backside of the knee and detect a vast, black (colour Doppler negative) area which has a “neck” between the gastrocnemius and semimembranosus muscles. 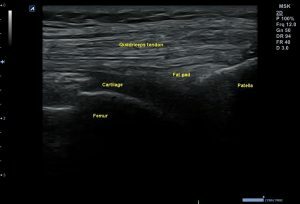 The physiotherapist can tell that liquid is seen in black in ultrasound and a Baker’s cyst exists between the gastrocnemius and semimembranosus muscles. One should always keep in mind that there is a risk of false and over interpretation in radiological examination. Tissue examination is not just about pathological findings. Noting healthy structures is also important. Practically, for physiotherapy it is enough to see if the structures look intact and if the situation seems stable. The diagnosis and the exact definition of the pathological condition with a written statement is a task which belongs to a radiologist. After a doctor has diagnosed a soft tissue injury, a physiotherapist can monitor the healing process of the injury with ultrasound, like the decrease of swelling. This is important, especially after muscle tears, where the muscle function may be restored, but structurally the muscle can still be weak. The real speed of recovery cannot be known without imaging, since the recovery is individual, depending for example on the location of the tear. If the healing is delayed, muscle is prone to re-tear. This may happen especially at the point where the muscle can be used without pain. For example among the football players of Premier League, the recurrence rate of hamstring tear is 12-48%. A physiotherapist can monitor the tissue’s healing process intensively by ultrasound, for example on each visit. Ultrasound scanning takes only a few minutes, so whether or not to perform it is not about money (surely depending on the pricing). The information about the speed of recovery is useful for the patient, the physiotherapist and the coach as well. An ultrasound scanning of the current state of the patient may give a reason to refer the patient to a doctor. Ultrasound may also give unexpected information which requires a visit to a doctor. 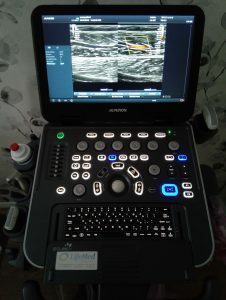 Only two weeks after purchasing an ultrasound system, I detected an abdominal aortic aneurysm which, after an ultrasound imaging performed by a radiologist, turned out to require regular control. How to get professional skills? The role of ultrasound in physiotherapy varies, depending on the country. Thus, the contents of the courses may also differ. In Denmark, a physiotherapist is allowed to define the pathological condition based on clinical physiotherapeutic examination with or without ultrasound imaging, while in Finland just reading this paragraph may cause uneasiness. 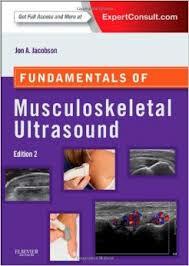 There are many courses available in abroad where to deepen the skills in MSK ultrasound. 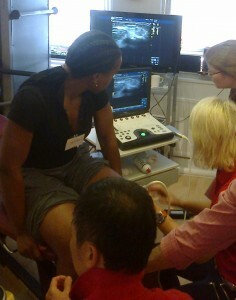 In London, the Sports Medicine Ultrasound Group hosted a basic course, where typical sports injury areas were scanned through. In the advanced course, participants got acquainted with injuries and healing processes of different structures (muscle, tendon, ligament, nerve). In a basic course hosted by EULAR the focus was on imaging joints. The intermediate course concentrated on pathology. Possibilities to learn musculoskeletal ultrasound imaging are getting better also in Finland because the Metropolia University of Applied Sciences has started a more specific sonography course for physiotherapists. 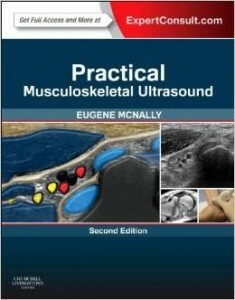 There are plenty of books available about ultrasound imaging. 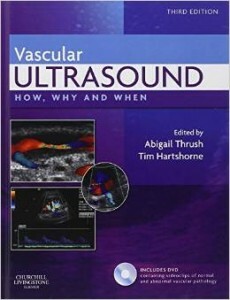 Along with the technical development of ultrasound systems, the image quality has improved and new books may also contain a DVD or an access to a picture and video library in internet. Internet education is also a possibility. Thus, there are many ways to learn ultrasound imaging. However, professional ultrasound imaging requires lots of experience. It takes around 6 years to become a radiologist. New and specialising radiologists estimate it takes 3-6 months of full time learning to be able to image the stomach independently. They also estimate that for a year after this, much learning still occurs, after which the amount of learning decreases. False interpretations may be done even after 150 controlled examinations. From a physiotherapeutic view, the essential scanning skill is much more easily obtained. A good ultrasound system and a possibility for consultation will advance learning. Includes the scanner with 3 probes, printer (Sony UP-D897) and a cart with 3 ports. The system and probes are in perfect working condition apart from battery (needs mains current). The system hasn´t been in daily use, convex probe almost unused. Image quality is excellent. Machine is easy to use, short booting time, quiet. Alpinion is remarkable South Korean brand, which sells machines to e.g. to hospitals where high quality imaging is needed. Functions eg: Frequency, dynamic range, rejection, colorize, virtual convex, angle steer, rotation, power, full SRI, persist, spatial compound, line density, THI, live dual, measurements, body pattern, zoom, focus, depth, gain, cine loop, video, Doppler: M, PD, PW, CF.